This timely two-volume compendium, Sustainable Horticulture, addresses the most important topics facing horticulture around the world today. 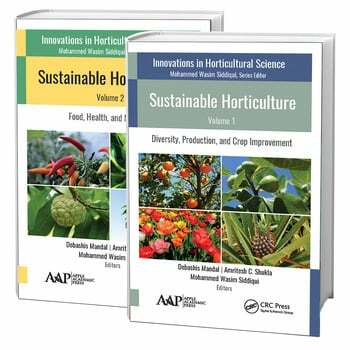 The volumes cover a wide range of topical issues and trends in sustainable horticulture today: Volume 1: Diversity, Production, and Crop Improvements, and Volume 2: Food, Health, and Nutrition. Global food demand is expected to be double by 2050, while at the same time the production environment and natural resources are continually shrinking and deteriorating due to many complex factors. Horticulture, a major sector of agriculture, is vital to enhancing crop production and productivity in parity with agricultural crops to meet the emerging food demand. 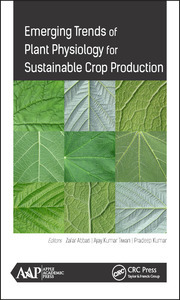 Implementing sustainable models of crop production is really an enormous endeavor. Promising technologies and management options are needed to increase productivity to meet the growing food demand despite deteriorating production environments. 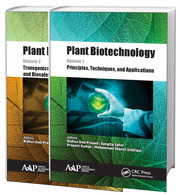 Detection of Phytophthora Using Molecular and Immunological Approaches in Citrus Spp. Debashis Mandal, PhD, is an Assistant Professor in the Department of Horticulture, Aromatic and Medicinal Plants at Mizoram University in Aizawl, India. Dr. Mandal started his academic career as Assistant Professor at Sikkim University. He had post doctoral research experience as a project scientist at the Precision Farming Development Centre, Indian Institute of Technology, Kharagpur, India. He has done research on sustainable hill farming for the past seven years and has published 18 research papers and three book chapters in reputed journals and books. He is a working member of the global working group on Lychee and Other Sapindaceae Crops, International Society for Horticultural Science (ISHS) Belgium and as Editor-in-Lead (Hort.) for the International Journal of Bio Resources & Stress Management. In addition, he is a consultant horticulturist to the Department of Horticulture and Agriculture (Research and Extension), Government of Mizoram, India, where he works on various research projects. He has visited many countries for his work, including Thailand, China, Nepal, Bhutan, Vietnam, and South Africa. Amritesh C. Shukla, DPhil, DSc, is currently Department of Botany, University of Lucknow, India. He was formerly a Professor in the Department of Horticulture, Aromatic and Medicinal Plants, Mizoram University, Aizawl, India. He began his academic career as Associate Professor at the same university. He has more than 20 years of experience on natural products and drug development and standardized various scientific methods viz., MSGIT, MDKT, MS-97, NCCLS (2002-03). He has developed six commercial herbal formulations and holds four patents. He has published 75 research papers and 15 book chapters. He has also authored six books and handled many externally funded research projects. He is a Fellow of five national and international scientific societies and also a Visiting Professor at the University of British Columbia, Canada, and the University of Mauritius. In addition, Dr. Shukla is working as an Editor, Associate Editor, and editorial board member of many internationally reputed journals, including the American Journal of Food Technology, Journal of Pharmacology & Toxicology, Research Journal of Medicinal Plants, etc. He has also been the visiting scientist at universities in Australia, Germany, China, and USA. Mohammed Wasim Siddiqui, PhD, is an Assistant Professor and Scientist in the Department of Food Science and Post-Harvest Technology, Bihar Agricultural University, Sabour, India, and author or co-author of 31 peer-reviewed research articles, 26 book chapters, two manuals, and 18 conference papers. He has 11 edited and an authored books to his credit, published by Elsevier, CRC Press, Springer, and Apple Academic Press. Dr. Siddiqui has established the international peer-reviewed Journal of Postharvest Technology. He is Editor-in-Chief of two book series (Postharvest Biology and Technology and Innovations in Horticultural Science), published by Apple Academic Press. 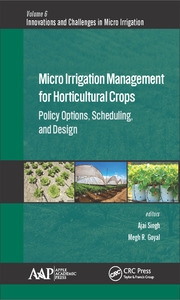 Dr. Siddiqui is also a Senior Acquisitions Editor in Apple Academic Press, New Jersey, USA, for Horticultural Science. He has been serving as an editorial board member and active reviewer of several international journals. Dr. Siddiqui has received several grants and respected awards for his research work by a number of organizations. He is an active member of the organizing committees of several national and international seminars, conferences, and summits. He is one of key members in establishing the WORLD FOOD PRESERVATION CENTER (WFPC), LLC, USA, and is currently an active associate and supporter. Dr. Siddiqui acquired a BSc (Agriculture) degree from Jawaharlal Nehru Krishi Vishwa Vidyalaya, Jabalpur, India. He received his MSc (Horticulture) and PhD(Horticulture) degrees from Bidhan Chandra Krishi Viswavidyalaya, Mohanpur, Nadia, India, with specialization in Postharvest Technology. He is a member of Core Research Group at the Bihar Agricultural University (BAU), which provides appropriate direction and assistance in prioritizing research. "A MAJOR PIECE OF SCHOLASTIC WORK THAT COVERS THE ENTIRE GAMUT OF THE STUDY OF HORTICULTURE, ranging from the diversity, genetics, biotechnology, crop improvement, field production, crop protection, postharvest management, processing, marketing, as well as the health and nutrition aspects. The geographical focus of both volumes is South East Asia, with emphasis on the vast Indian subcontinent and associated islands. It provides readers with a comprehensive understanding of the various aspects of the horticultural scenario in India and other countries in the region. Taken together, the two volumes make for VERY INTERESTING INSTRUCTIVE, AND INFORMATIVE READING. They will serve as reference materials for several years to come."